This 24VDC powered, normally-closed (NC), solenoid valve has push-fit tubing input and outputs designed for standard 1/4″ tubing. The electrical connection on this solenoid valve fits the DC24 accessory ports found on the FMM, 1Link, and Energy Bar 832 products. Common uses include safety stops for RODI systems, CO2 systems on calcium reactors, and many other places where you want to control the on/off flow of water, air, or other gasses. Adapting soft 1/4" tubing can be done easily with a 1/4" stem x 1/4" barb adapter. 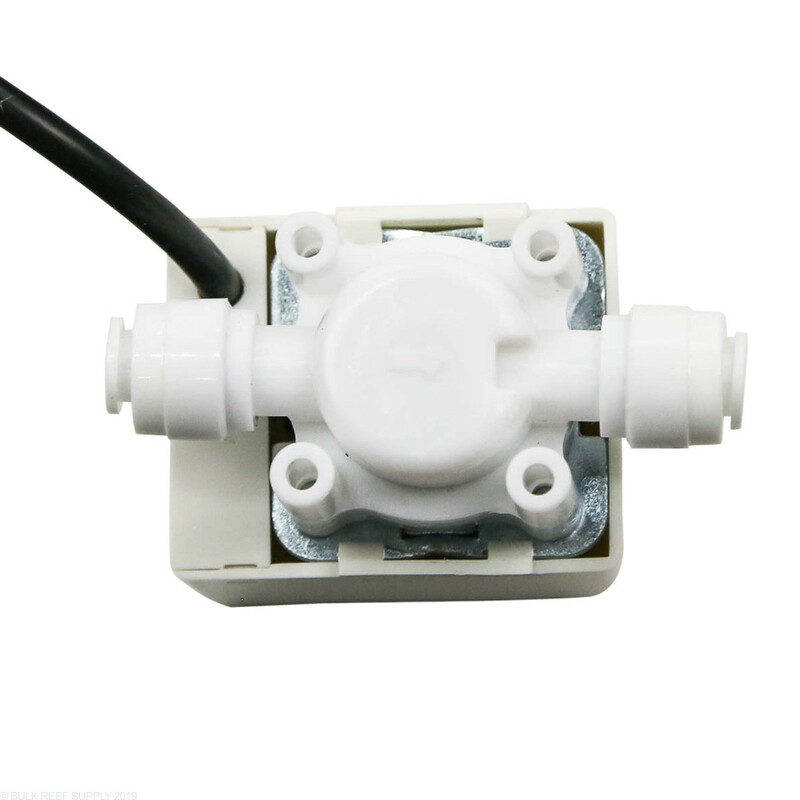 This solenoid valve can also be used with our standalone 24VDC power supply (not included) if you do not own one of the above products and want to use this solenoid valve with your Energy Bar 8 or Energy Bar 4. Failed within a month. Used for RO water. Now have to mail in old, have inspected and a new one shipped. Kind of a hassle. 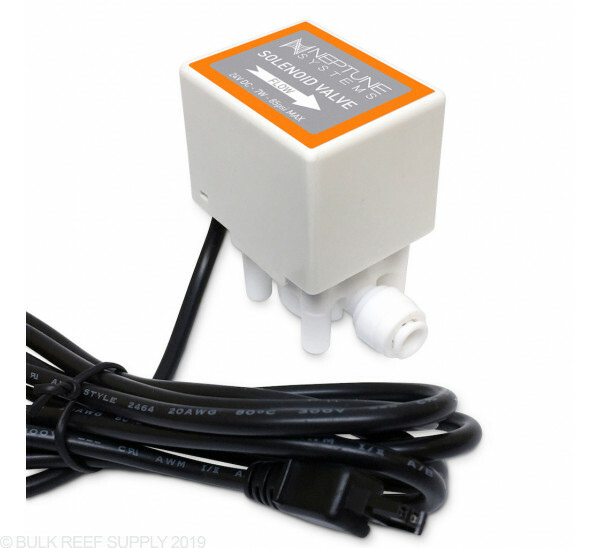 I had this unit connected to my RODI line controlled by my ATK to top up my sump, but it would not completely stop the flow of water as if it wasn't strong enough for the source pressure. Save your monies time and frustration, don't buy this one. Could not figure out where my tin was coming from - I believe I found it. This unit must have gotten some salt splashback and corroded and then shorted out - brown rust dripping into sump. Using it at end of ATO Saltwater to be a secondary syphon preventor. Not happy but for $29 I guess I should not complain - warning saltwater users. I had to return it to Neptune for repair/evaluation. I’m using it to control the CO2 flow for my calcium reactor. I installed a check valve on the needle valve on my CO2 regulator and then attached tubing to the solenoid. Turns out that the solenoid is not suitable for saltwater contact, so the check valve needs to be in line after the solenoid to keep it from getting wet (fresh water is fine). I don’t have a complete resolution from Neptune yet, but it looks like they are going to fix or replace it. Only problem is, I had to send it for evaluation, so my calcium reactor is running without a controller until the problem is resolved. My biggest complaint is that the product description and instructions didn’t mention that it isn’t salt water compatible. Basically it failed straight from the box, and I’m jumping through lots of hoops to get it fixed. This valve works nicely on the accessory port of the 1link module so no additional outlets are needed. I am using it to control Top-off water going to my Kalk Stirrer. Have not had it long, but it is working well so far. Let us hope that the longevity is better with this valve than with many of the other Neptune peripherals I have bought recently. Would definitely recommend. Great addition to the apex! 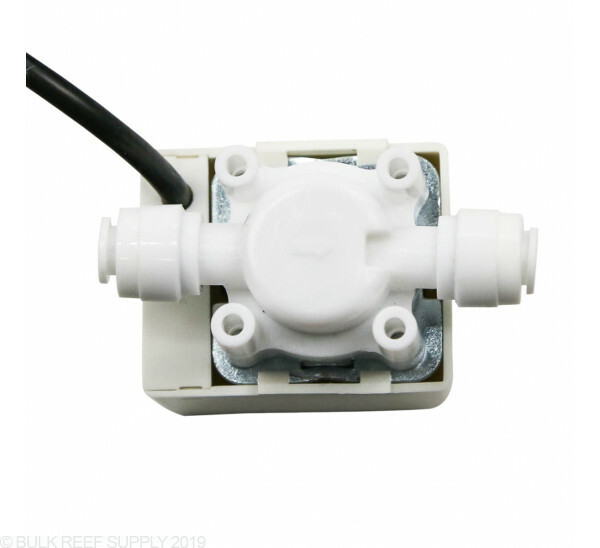 Is this valve compatible with salt water or does it require RODI only? 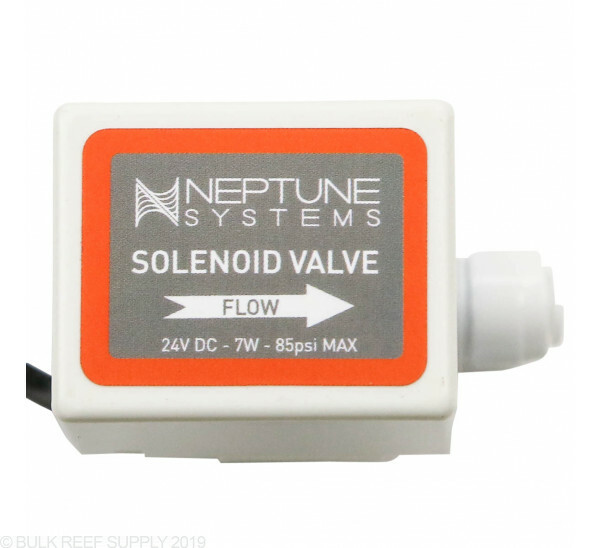 I'm afraid the internal magnetic piston of this solenoid is exposed to the water flow, and as a result it would not be wise to use in a saltwater application. This would be best used for RODI water only, or gas applications. 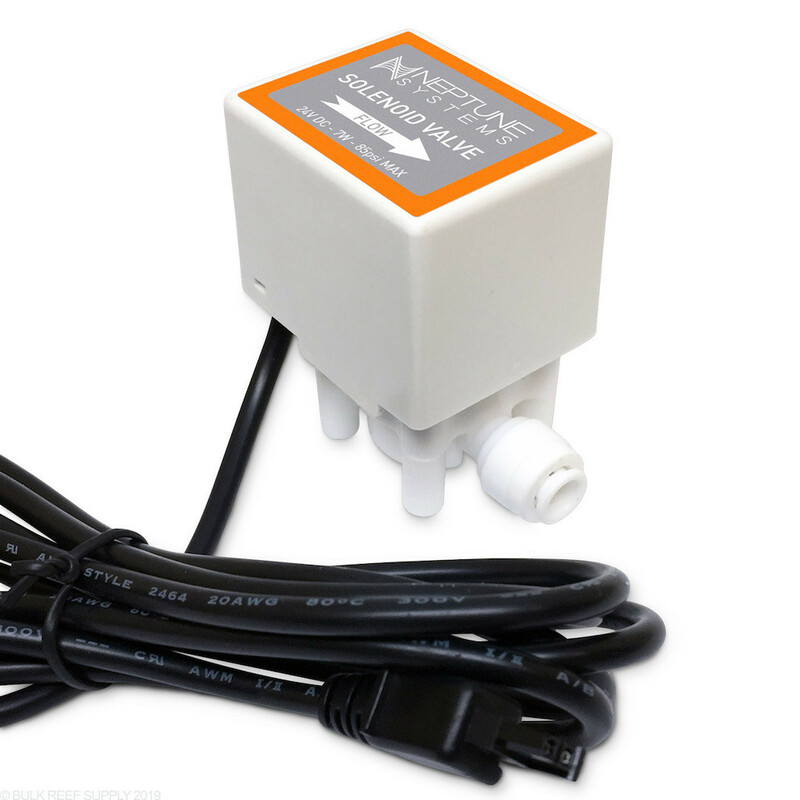 So, if I have an ATO reservoir that's directly connected to my RODI (via float valve), could I insert this between the two to open the flow via fusion/app, filling the bucket? Just using the float valve, I'm finding that the constant trickle of water is rapidly depleting my DI resin. You definitely could use it for that. I would keep the float valve in place, as a backup, but you could also get two float switches and a breakout box to automate the task completely. Placing one float sensor at the bottom of the reservoir to tell the solenoid to open, and one at the top to tell it when to shut off, with a float valve back up sounds like a pretty sweet setup. What are the measurements and how long is the cable? 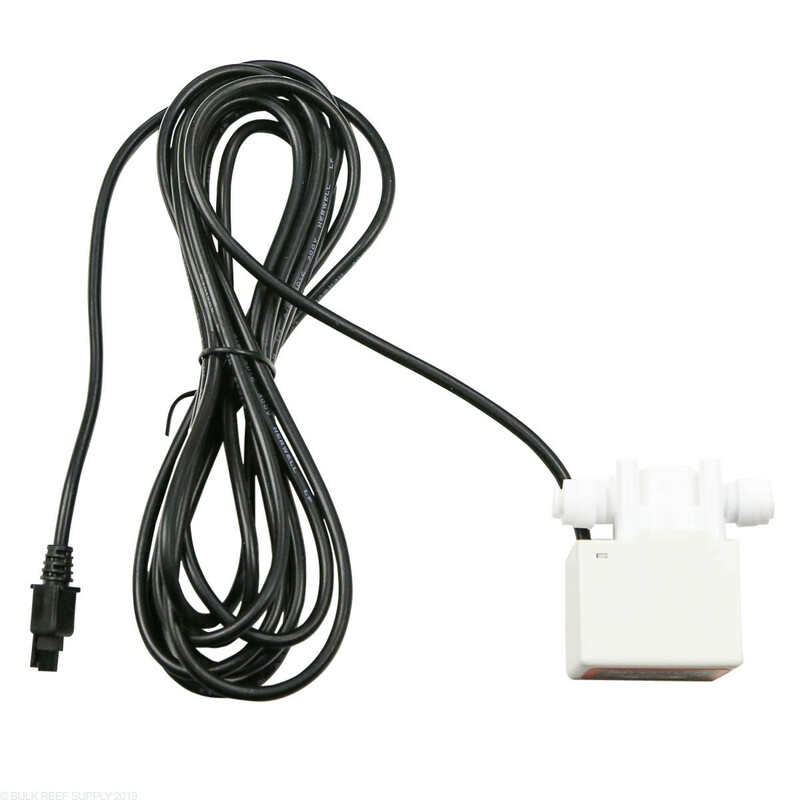 The solenoid measures 2.4" x 2.5" and has a 13 ft. cord. If you have any other questions, let us know! Can i add to the length of cable? 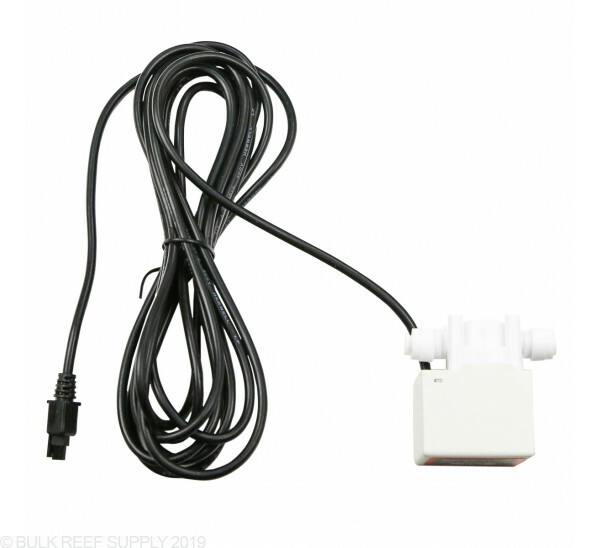 Here is a link to the product you're looking for (https://www.bulkreefsupply.com/dc24-10-extension-cable-neptune-systems.html). Have a great day! How would you incorporate the 24V power supply? It looks as if the power supply is internal to the solenoid valve. Power for the solenoid is designed to be provided through the 1Link accessory plug which the solenoid will plug into through an appropriate module such as the FMM, 1Link, or EB832 power supply. For the FMM and 1Link, a 24v power supply will be plugged into the module. I'm trying to incorporate automatic water changes with my Red Sea 525XL using a DoS. Is this something I can use to stop the ATO temporarily while the DoS is swapping water over the course of the night? As long as you are adding new water to the system at the same rate you are removing old water your ATO should not engage. 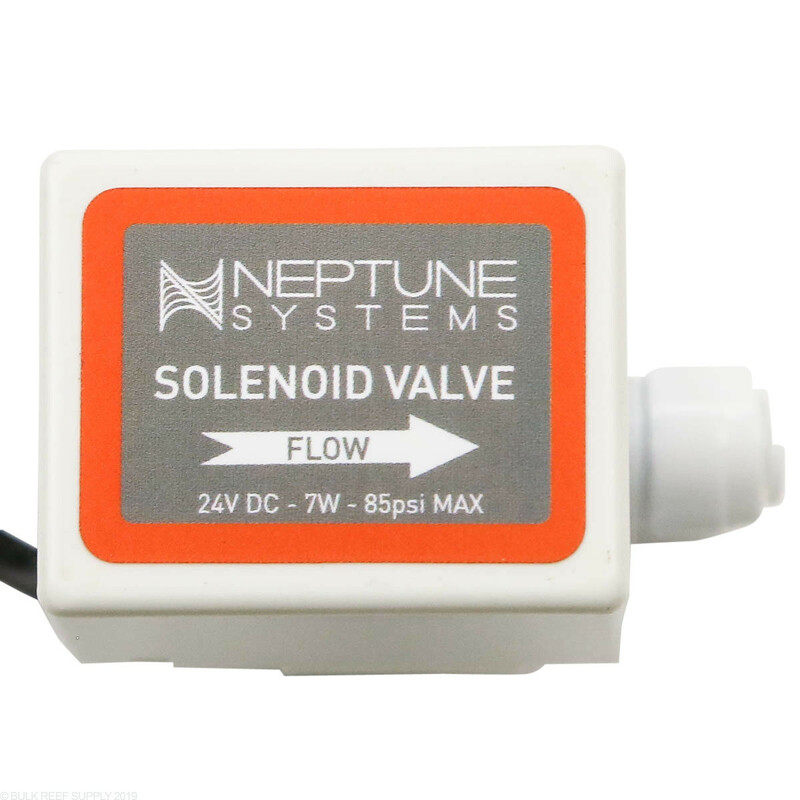 If you are using a float valve connected to Red Sea top-off container this would provide an additional level of safety should your clean water reservoir ever empty prior to the water change cycle ending provided you catch it before the solenoid valve opens again.